Over the past week, the Spokane and Coeur d’Alene area had a few different Winter Advisories come through. The weather systems brought snow, ice and rain mixture to coat anything and everything exposed to the elements. So much snow has fallen lately and the rain only makes it heavier, if you haven’t ventured out to your hot tub, it may be time to. 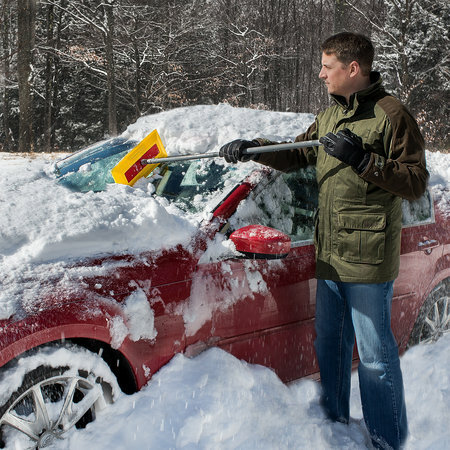 Be safe, a good snow shovel should be used to clear a safe pathway to your hot tub and around it. This path will allow you to remove all snow, ice and excess water build up on the hot tub cover. It’s important to use a soft broom or foam protected item when removing snow or debris off your hot tub cover. Pool World recommends a soft bristled broom or a SnoBrum. Removing snow, built up ice and water off the cover will help to extend the life of your cover. Plus it will make it easier to access your hot tub to soak.